Yesterday I was interviewed by Gabrielle Karol of FoxBusiness.com for an article that appeared today on small businesses that are centered around fantasy football. It’s always funny to tell my story of how I sculpted my first trophy based on drawings and photos I took of my cousin Johnny and how I unveiled the trophy to the guys in my league nearly 20 years ago. I told her how I’ve been doing fantasy football since 1990 and how, back then, we had to look up all of our stats in the paper since the internet wasn’t even around yet. 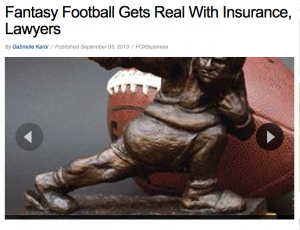 Telling my story really emphasizes how lucky I feel to have such a great small business that let’s me do something I love and how grateful I am to the fans of FantasyTrophies.com.